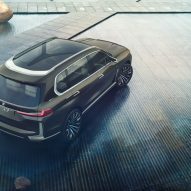 Dezeen promotion: BMW has unveiled its design for a six-seater SUV, as part of an expanded range of cars that promise customers a more luxurious experience. 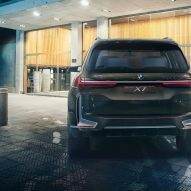 First unveiled at the Frankfurt Motor Show in September, the BMW Concept X7 iPerformance is conceived as a hybrid vehicle, combining an electric-powered engine with a twin-power turbo petrol engine. 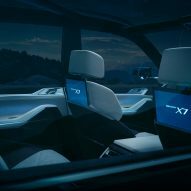 Inside, the car's six seats are arranged in three rows to create plenty of room for passengers, while a digital interface enables a variety of personalised services. 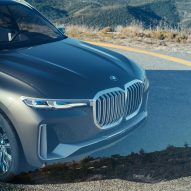 BMW sees this vehicle as a game changer, combining the luxury features offered by other brands with the distinct identity of a BMW. 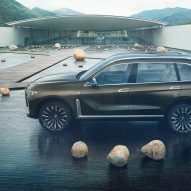 "Since BMW founded the Sports Activity Vehicle segment with the first X5 back in 1999, every subsequent X vehicle has broken new ground," said BMW's Ian Robertson. 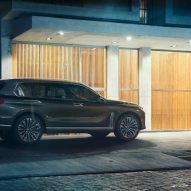 "The BMW X7 continues this tradition: the X family's new top model extends BMW's offering in the luxury class and redefines the concept of luxury for the BMW brand and beyond." 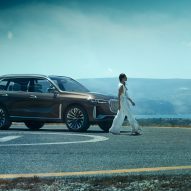 "Furthermore, the BMW Concept X7 demonstrates it's perfectly possible to combine a large sports activity vehicle with an electrified drivetrain." 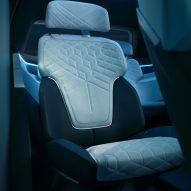 BMW has launched a new brand identity to represent all the cars in its new luxury range, using the name the company's original name: Bayerische Motoren Werke. This identity is represented by a monochrome version of the roundel used by BMW a century ago. 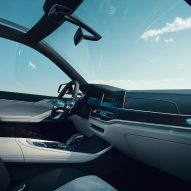 "Our luxury models are united through our DNA – the pride of our origins and our courage to always reinvent ourselves," said BMW. "The 'Bayerische Motoren Werke' incorporates an attitude, which is shown in everything we do." The Concept X7 iPerformance offers a look ahead to the production X7, set to launch next year. 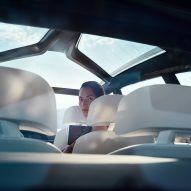 The concept car's other features include a large glass roof that offers panoramic views of the sky, 23-inch light-alloy wheels, olive-bronze leather seats and 12.3-inch control screens. Digital services cater to work and entertainment, so that passengers can make their journey "more comfortable, more entertaining or more productive". Passengers can share content with one another, such as music tracks, webpages and map locations.